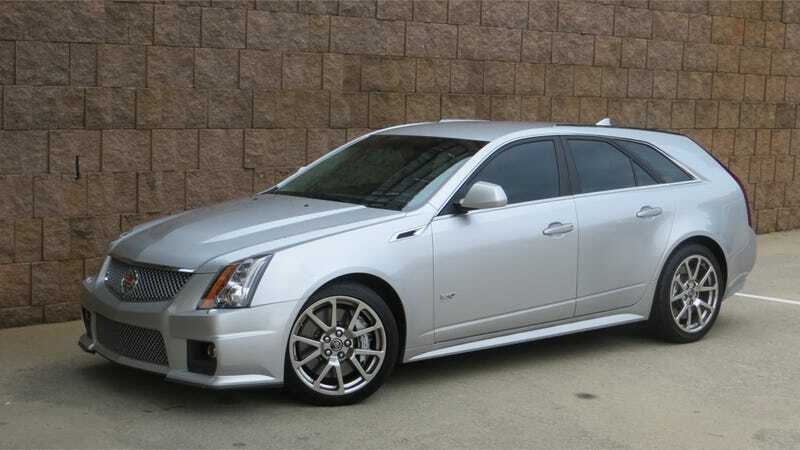 CTS-V Wagon Update: How Much Power Is Too Much? I’m coming up on three weeks – and 1,000 miles – in my new Cadillac. That means I’m getting used to many of its distinctive quirks. Like, for instance, the D-pillar, which is only slightly smaller than a mule deer. And the fuzzy steering wheel, which provides drivers with the distinct feeling that they are, in fact, piloting a stuffed animal. Admittedly, these are a lot easier to manage than the issues with some other cars I’ve owned. For example: I once had a Lotus, and I found it was easier to see traffic lights by looking over the windshield frame rather than through the windshield itself. I also owned a Mercedes G-Wagen, whose biggest quirk was that my ownership experience involved 20 percent driving it and 80 percent convincing friends and family that I am not an enormous douchebag. I’m also adjusting to the Cadillac’s automatic transmission. Many of you were angry when I bought this car with an automatic. I know this because several random strangers sent me e-mails that said: I am angry that you bought this car with an automatic. - ARE YOU OUT OF YOUR MIND? - DO YOU NOT KNOW HOW TO DRIVE A STICK SHIFT? - PLEASE GIVE ME YOUR ADDRESS SO I CAN COME BY IN THE NIGHT AND MURDER YOU AS YOU SLEEP, THEN DO A TRANSMISSION SWAP. And I admit, I would’ve rather had the car with a stick shift. But when you think about it, that’s almost cheating. Consider it: Journalist buys 556-horsepower, rear-wheel drive station wagon with six-speed manual transmission. What the hell do you think is going to come out of that? Negativity? Hell no! I’m going to rave about the car for months, and you’ll be bored, and I’ll be bored, and the Cadillac PR department will send me a cake the size of the D-pillar, which means I’ll need most of my Facebook friends to come over and help me finish eating it. So, begrudgingly, I’m adjusting to the automatic. I’m even coming to terms with being a Cadillac owner, which is really the biggest adjustment of all. People know I’ve recently bought a cool car, and they eagerly ask me: ”What did you get? !” You should see the looks on their faces when I reply “A Cadillac station wagon.” Really: if I tell this to someone who isn’t into cars, he will look at me like he’s a six-year-old boy and I’ve just let it slip that Santa isn’t real. Maybe the only thing I’m having trouble adjusting to is the speed. Here’s the problem: this car has 556 horsepower. Many of you out there are thinking: HOW IS THAT A PROBLEM?! In fact, I expect to get several e-mails later today with precisely that question, including at least one that involves both a death threat and, simultaneously, an engine swap offer. And I admit that by saying this is a problem, I’m opposing something that we car people have always believed, namely that more power is always better. But I will explain precisely how the car’s horsepower is a problem, using my usual journalistic style: hyperbole and half-truths. Let’s start with where I use the V. Since I have a daily driver, most of my Cadillac time is spent on curvy roads with no one around. To that end, 556 horsepower is simply overkill. With so much power, you have to be very careful with the throttle coming out of corners – and you get going so quickly in straightaways that each new turn requires a deep stab on the brakes. Really: this is one of those cars that brings suburban moms to the sidewalk where they flap their arms and scream about how speeding is only OK when they're late for soccer practice. So what about the highway? This, too, does not require 556 horsepower. In fact, the Cadillac hits 60 mph in under four seconds, which means it reaches speeds that are illegal in every US state in less than five. More importantly, the power is so easy to access that you quickly realize this is the first Cadillac in history where you’ll have to hide the keys from your teenage son. This might be the biggest problem of all. So many of us like the Miata, the S2000, the M3, the 911 - all because power lives at the top of the rev range. You have to work for it. In the Cadillac, it's always there and so easy to access, which is the stuff YouTube crash videos are made of. Now, I’m aware the power would be well-suited for a racetrack. But Cadillac surely knows most V buyers will never bring it there – and for those that do, it will only be a small part of the ownership experience. So why all the power? The reason, of course, is that Cadillac wanted to make a splash in the luxury performance world, previously dominated by BMW and Mercedes. They wanted to raise the stakes against those automakers and deliver the fastest, most powerful sedan (or in my case, wagon) around. They wanted to give V buyers the chance to look at people driving an E63 or an M5 and say: “I have more power than you, neener neener neener.” And they succeeded. But at some point, you have to wonder if all this horsepower one-upsmanship is really necessary. Wouldn’t the car be just as fun with 456 horsepower, rather than 556? Probably. A manual transmission would be nice, too. @DougDeMuro operates PlaysWithCars.com and writes for The Truth About Cars. He owned an E63 AMG wagon and once tried to evade police at the Tail of the Dragon using a pontoon boat. (It didn't work.) He worked as a manager for Porsche Cars North America before quitting to become a writer, largely because it meant he no longer had to wear pants. Also, he wrote this entire bio himself in the third person.